The world has become a dangerous place, and you need to be prepared for the worst. Our Tactical Plate Carrier Entry Vest is an extremely comfortable one size fits all vest that has a front and back Molle system. This lets you position Molle pockets for your radio, taser, handcuffs, etc wherever you'd like them. Our design also comes with a drag system load on the back of the vest. 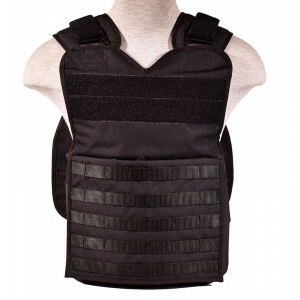 The Tactical Entry Vest houses a pocket for a Shooter's Cut Level 4 Shock Plate in the front, and a similar pocket in the back of the vest for a Full Cut plate. When properly inserted, the Level 4 plates will protect your vital areas from rifle rounds, including .30-06 and armor piercing ammunition. The straps on the shoulders of the vest can be conveniently adjusted to the size of the officer's torso and has foam padding for maximum comfort. The elastic can be easily adjusted around the waist for a snug fit. We know that things are uncertain right now, and we want to ensure everyone has access to protection if they feel they need it. Keep Protection within reach with BlueStone Safety Products. Stay Safe Everyone. NOTE: This plate carrier has NO BALLISTIC PROPERTIES on its own. The vest needs Level 4 plates inserted into the vest in order to stop rifle rounds.